Facebook monitoring and censorship is at an all time high. With so many attacks on Independent and Citizen Journalism as of late, wouldn’t it be nice to know who is monitoring your page? With these Facebook secrets, now you can! With the help of the most amazing readers and truth seekers on the planet, we have received so much feedback on this article! To update, Facebook’s algorithms prevent malicious blocking attempts on an account, which explains why some accounts cannot be blocked (as noted toward the end of this article). 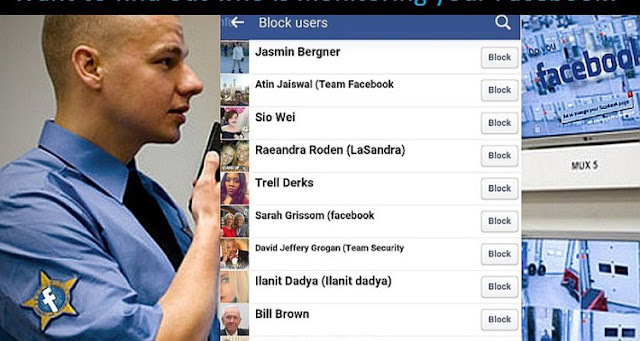 As was noted originally, it isn’t clear, nor is there a way to know for sure who those people are, but what we do know is that the feature to prevent blocking is built in to Facebook, and their search feature brings up a relevant list of names. Citizen journalism and research is a powerful tool, and this proves it. Nothing is more exciting than when people are active in making sure their rights and privacy is protected! In a world of universal deceit – telling the truth is a revolutionary act. That is one of my favorite quotes. It applies to this post, because social media has become home to the worlds largest platform’s for news and information. If you write articles, have a blog, and/or otherwise use some sort of mechanism to disseminate information, you are probably on Facebook, Twitter or Instagram. In recent times, we have seen a huge increase in attempts to silence dissent, censor independent and alternative news sources, and redirect the public back to the mainstream. This inorganic attempt to steer the public away from posts or news sources that don’t fit the mainstream narrative or status quo is failing. Miserably. The truth is, people want real news and information, and real news and information, is always much more intense. Reality and truth itself is always much stranger than fiction, as the saying goes. Of course, social media censors and the media will say independent media uses “dangerous tactics” that they call “click bait” to grab their viewers. While it is certainly true some websites are known for this, overall, it may just appear that way more or less due to the fact that as stated earlier, the truth is raw and to those who are asleep, it really is fantastic. With these recent attempts to censor anyone who doesn’t fit the status quo, Facebook announced it will employ new methods to combat so-called “fake news.” As one may predict, the “sources” who will have the power to “review” posts for “authenticity,” have an obvious conflict of interest. In addition, did you know there are people literally watching your Facebook account? Yes. There are people who have a specific duty to monitor your posts and activity. While there are many Facebook secrets, for those who enjoy privacy, this one is for you! Facebook Secrets: So, what can you do? First of all, we must tell you there is no way to know for sure who these people are. Also, you may not be able to remove or block every account that monitors your activity, although when I did it on my account, I was able to get rid of most. A new window will pop up. The list you see is a list of [most likely] Facebook employees, spies, and private accounts that are paid to shill for who knows who (sarcasm (kind of)). The ever growing world police and nanny state extends to the virtual world too. In fact, it probably lives in the virtual world in an even greater capacity than the physical world, it’s just that the physical world gives us a different feeling and emotional reaction when we recognize it. Have fun, and enjoy your new found freedom! NOTE: If you are a Facebook Page owner that posts independent or alternative news of any kind, we would like to hear from you! Are you being censored? Are some of these people that came up on the list friends with you, or friends with your friends? Have they interacted with you? Have your posts been improving since you blocked them? Are you blocked from being able to block them? Let us know!